NOTE: On January 15, 2018, Power Wallet shut down its operations and purged all information from its database. If budgeting is a pain for you, Power Wallet has an online tool to help you track spending, create budgets, specify financial goals, and get bill reminders. Think of Power Wallet as an online hub or dashboard where you can view all your financial accounts in one place at anytime. Whether you want to monitor your cash flow, track bills or get due date alerts, Power Wallet gives you the oversight and insights you need to simplify your finances. 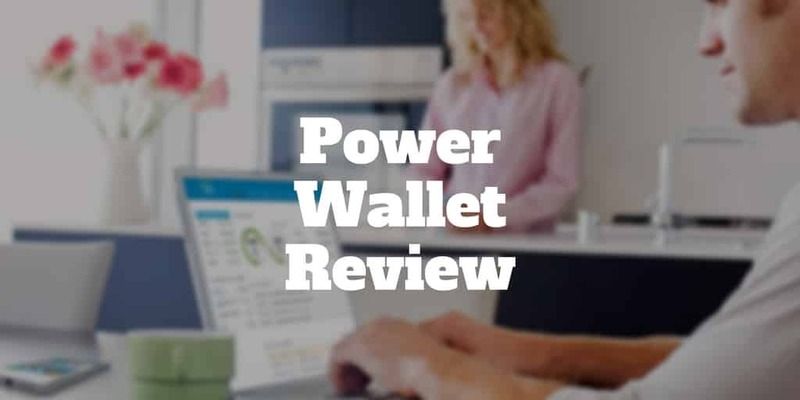 Much like Personal Capital, which connects all your financial accounts and displays them in one location on your mobile devices, Power Wallet is a web-based budgeting software that enables you to holistically view all your financial accounts on one dashboard. Where Power Wallet wins brownie points is on cost – it is free – and ease of use, though you cannot access it on-the-go via mobile phone. How Secure Is Power Wallet? Power Wallet simplifies the process of viewing your finances holistically. You can easily track your income and spending, as well as your cash flow. As a personal finance budgeting tool, Power Wallet connects all your financial accounts in one place, so you are not left wondering how much you are earning or spending overall. The company was the brainchild of Bob Sullivan, who saw a need for people to take control of their finances beyond credit card debt, student loans, and mortgages. The idea was to build an easy-to-use platform to manage and track all income, spending, and debt. The mission behind Power Wallet is to empower individuals and families financially with a personal finance planning tool to rebuild and secure their financial futures. The first step in getting started with Power Wallet is to connect your online financial accounts. 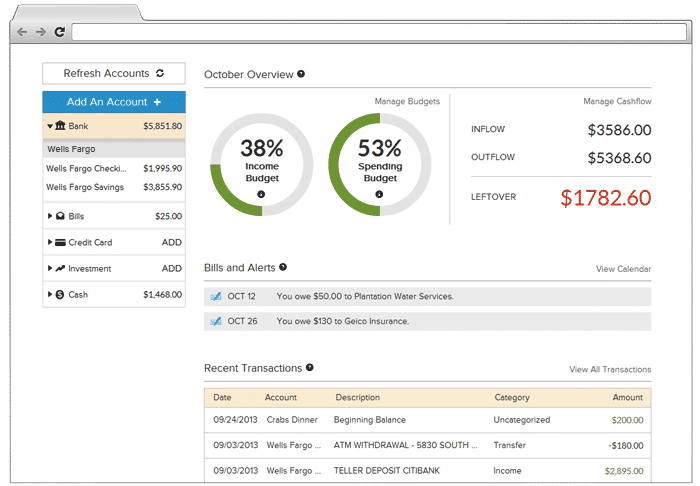 Next, you can create financial budgets and track spending, as well as set up billing alerts to help you avoid paying late fees. You can then monitor your cash flow by category and modify your spending habits to make changes needed to achieve your financial goals. When you log in, you will see an interactive calendar that provides a monthly overview as well as daily activity and billing reminders. You can easily create alerts when it is time to make a payment, so staying on track is easier than having a fistful of post-it notes scattered around your desk that you might otherwise have relied upon. Beyond budgeting, saving is a focus at Power Wallet, which helps you spot deals and coupons. Each discounted opportunity is personalized to your interests and spending patterns, so you don’t receive a haphazard list of offers but rather you get access to discounts on items you might otherwise pay higher prices for elsewhere. Free financial education is also available at Power Wallet via its PowerBlog. Are all-inclusive vacations a deal or a waste of money? Cash vs credit: do you save money by not using a credit card? Should you divulge your salary when interviewing? Is it smart to quit your job before lining up another one? How should you allocate your tax refund? What percentage of your salary should be allocated to rent? What apps are best to split checks at restaurants? Should you haggle when you shop? How do you navigate credit card fees? Power Wallet is a free, easy-to-use personal finance budgeting tool that connects you to personalized deals and discounts, provides billing alerts, and a portal to easily pay bills online, though it is only a web-based interface currently and does not account for tangible assets, such as a home. ✅ Free Budgeting Tool: Power Wallet is free to use, so you can connect all your financial accounts in one place at no cost. ❌ Mobile App: Power Wallet has a notification stating that its mobile version is coming soon. ✅ Easy-To-Use Budgeting Tool: If logging into multiple online credit card and bank accounts is a headache, Power Wallet simplifies your financial life by connecting all your accounts in one dashboard for easy viewing, tracking, and financial goal setting. ❌ Universal Account Compatibility: You may find some utility providers, insurers, ISP providers, and so on are not supported on the platform, which detracts from the overall goal to sync all your income and expenses in one online dashboard. ✅ Personalized Deals: The deals available through Power Wallet are customized to your own spending habits so you get offers you actually want. ❌ Tangible Assets Not Supported: If you own a home or rental property, you can’t easily account for it because Power Wallet caters to online financial account integration only. ✅ Billing Alerts: Alerts will pop up on your dashboard or be sent to you via email depending on your notification preferences to help you avoid late penalty fees. ✅ Dashboard View: Most banks and financial institutions are supported, and it is straightforward to find and add them to your account. 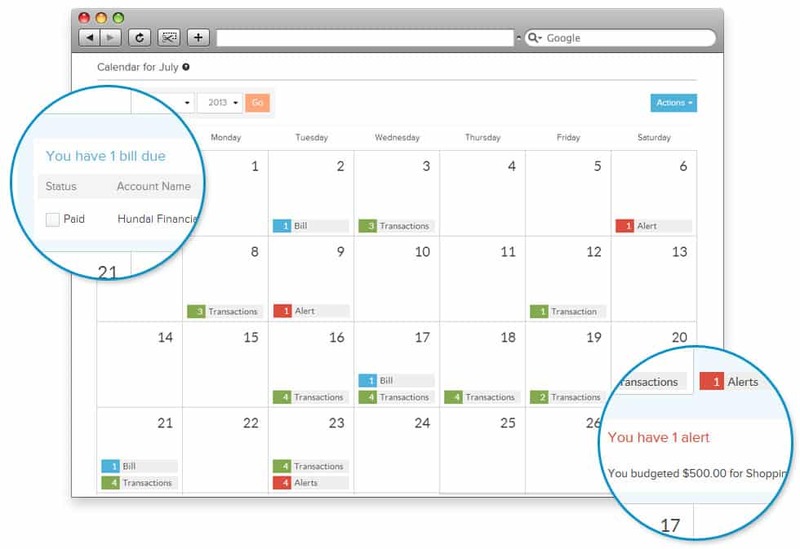 ✅ Bill Pay: Not only can you track your finances in one place, but you can pay bills too. Rather than visiting each credit card website to pay multiple bills for example, you simply select the “Pay my bill” button and you will be directed to the credit card website to pay your bill. ✅ Power Saver: Next to your transactions, Power Wallet features Power Saver notifications that help you to save money on items you purchase. When you link your financial accounts to one portal or online hub, you want to know that your personal information is kept safe. To keep your information secure, Power Wallet uses Comodo and Comodo Webinspector. Each day, the Power Wallet website is tested to provide the highest level of security and protect against online threats, identity theft, spyware, and viruses. The platform relies on 256-bit SSL encryption and is read-only. Plus, Power Wallet commits to not selling your personal information to any third parties. As budgeting tools go, Power Wallet is hard to beat because not only is it easy to use but it is free. Where it shines is its dashboard view that lets you holistically view all your financial accounts in one place as well as pay bills easily without having to log into many online portals. A really nice feature is next to your transactions, you receive alert notifications showing you where you could save money on items you actually spend money on – as opposed to irrelevant coupons on things you don’t want or need. Plus, Power Wallet has its own PowerCard rewards program to help you save even more on goods and services you want. If there is a drawback to PowerCard, it is the lack of a mobile offering and lack of integration into some account providers. If a mobile solution is what you want then Personal Capital is a better choice, but it’s hard to beat Power Wallet on value because the entire software budgeting tool is free to use. ‹ Smart401k Review 2019 – Paying High Fees In Your 401k?